Easter is right around the corner so today I’m bringing an incredibly fun Easter basket treat, Homemade Strawberry Peeps. With some time and patience you can blow your family away with these homemade sweets. You’ll never buy them at the store again. This post contain an affiliate link. That means if you click through and purchase, I may receive a small commission at no cost to you. I only recommend products I love and all opinions are my own. For my full disclosure policy, click here. I’m on a homemade kick lately. Homemade usually tastes so much better than the store bought stuff but sometimes the time it takes to make it on your own just doesn’t make up for the taste. Well, let me tell you, these homemade strawberry peeps are completely worth all the effort. I’ve never really loved marshmallows (blasphemy I know) and especially not peeps but I’m looking at marshmallows in a different light these days. I’ve always heard that homemade marshmallows taste so much better but candy making has always scared me a little since you have to be pretty precise. But I thought I owed it to you guys to at least try it and see if I could pull it off. They weren’t hard to make at all you guys. All you need is some time and patience. I also worried they would ruin me and cause me to never want to buy them at the store again. I was right because never I’m eating those again. Another great thing about them is that they last for weeks in an airtight container so you can make a huge batch the week before you go camping for homemade marshmallow s’mores. I can just see it now. The marshmallow peeps get their strawberry flavor from pulverized freeze dried strawberries (find them in the dried fruit section). I was worried the extra water in fresh strawberries would mess with the texture so I went this route with lots of success. 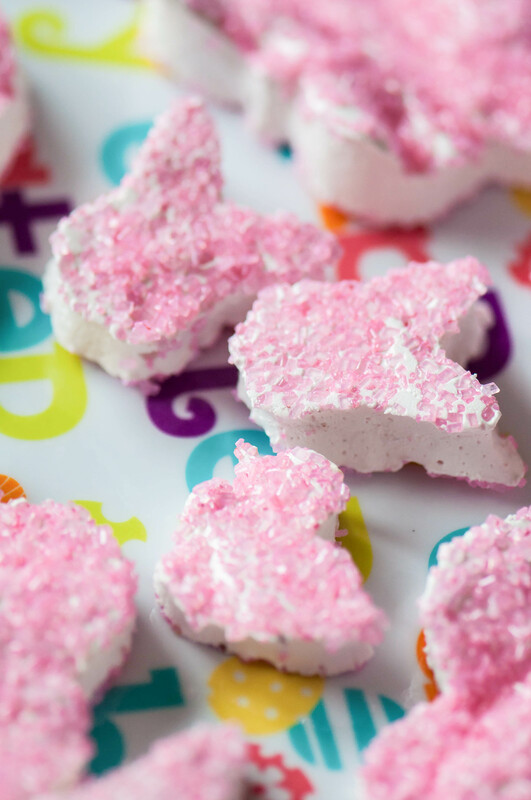 Let me tell you about the process of making these delectable homemade strawberry peeps. First you have to bloom the unflavored gelatin while you work on the sugary part. Don’t get scared right off the bat with the terminology, you just mix the gelatin with water in the bowl of your mixer and walk away. On the stove top, water, sugar, corn syrup, the strawberry dust and a pinch of salt are combined and boiled until the mixture reaches 240 degrees. Be careful not to go further as it can turn the mixture hard fast. A candy thermometer is recommended but I don’t own one so I used my favorite digital thermometer that I can set to beep at me when the target temperature is met. That way human error is eliminated. What did we do without technology? Then you *carefully* drizzle the hot sugar mixture into the gelatin while the mixer is running on low. Once it’s well combined, bump that sucker up to high and let it whip it for 10 to 15 minutes. If you follow me on Instagram stories you saw the process as I went along and it was so fun to see how it turns from this sugary weird liquid to pale and thick gooey goodness. See, it’s not so hard after all. My least favorite part was spreading it out on the greased and sprinkled baking sheet. As you can guess, it’s incredibly sticky and does not want to smooth out easily. Once I coated my hands in coconut oil the process was much simpler. Then you top them with more sprinkles and let it dry/set/cool for an hour. While the marshmallow is cooling, collect your chosen cookie cutters to create fun, festive shapes. Grease them with more coconut oil, punch out the shapes and store them in an airtight container. With my standard size cookie cutters I was able to get 22 peeps along with some cut little mini’s in the spaces between the large cutouts. There was also almost a quart size bag worth of scraps that we’ve been munching on throughout the week too. I think these would be adorable packaged in some cellophane and tied with a pastel ribbon or you could even stick a small lollipop stick in them to make them into peep pops. Either way, these homemade strawberry peeps will make your Easter baskets so much better than ever before. If you want to go completely homemade for the Easter baskets this year, you have to make my favorite homemade candy, coconut eggs too. Line a 10x15-inch baking sheet with foil and grease with coconut oil (if you don't like the coconut flavor it leaves behind, use butter instead). Sprinkle with 2/3 cup sprinkles. Set aside. In the bowl of your stand mixer, combine 1/2 cup water and the gelatin packets. Stir well to combine and set aside. In a small saucepan over medium heat, combine remaining water, sugar, corn syrup, crushed strawberries and salt. Stir well then cover with a lid and leave alone for 4 minutes (watch it carefully so it doesn't boil over). Remove the lid and place a candy thermometer or digital thermometer in the mixture making sure it doesn't touch the bottom or sides of the pan. Boil the mixture, without stirring, until it reaches 240 degrees F.
Once temperature has been reached, remove from heat and carefully drizzle into the stand mixer while it is on low (using whisk attachment). Once combined, increase speed to medium for 2 minutes. Finally, increase speed to high for 10 to 15 minutes, until mixture is thick, pale and mostly cooled. Grease your hands with coconut oil (or butter) and carefully dollop the marshmallow mixture over the sprinkled baking sheet. With your hands, evenly spread the marshmallow until it fills the pan. Top with the remaining sprinkles and set aside for an hour to set up and cool completely. When you are ready to cut the shapes, grease the inside and outside of the cookie cutters with coconut oil. Cut shapes and place in an airtight container, placing parchment or wax paper between each layer. Homemade strawberry peeps will last for a few weeks.